For the past week I have been getting some deep, serious work done - wrestling with two polar opposite concepts: 1) how Social Media scales to a large audience in an authentic and personal way [still figuring it out] and 2) exploring the issues around social network portability that Brad and Brian and others are thinking about. [Dave has a complete list of recent posts]. The result of being torn between these two universes is that I have been feeling a bit like Sybil. My head needs a rest. It has probably been over five years (if not more) since I have gone completely dark for an entire week. But, that is indeed what I will be doing for the next 10 --gulp--10 days. I will be unplugged, off the grid, and digitally out of touch [tha includes twitrter and facebook] from tomorrow through September 3rd. Why? 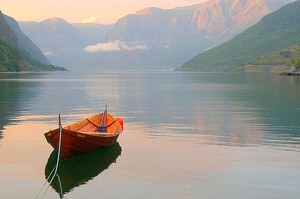 Because I will be out on the ocean exploring the Norwegian Fjords! My friends and family say; "well, it's about time" and my industry/geek friends are wondering how I am going to cope. Wish me luck. I promise lots of photos and stories when I return. A special thanks to Brian Solis for graciously lending me his zoom lense [I promise not to drop it over board--on purpose]. Yesterday I had a bit too much coffee while catching up on my feeds. The result was a conversation starting in the middle. Confusing to some, as I got more than one ping from people going, huh? Here's the deal in a nutshell. In an attempt to cut through the noise and complexity of being heard today, Saatchi believes that reducing a brand to one word that they metaphorically OWN is the way to go. "global ownership of one word globally - define the one word that you want to own in the public mind"
To make matters worse and what really sent me over the edge was that their website is a slow moving, static pretty flash movie with a confusing UI. Once it loads I suggest clicking on hear. (it took me a while to realize I needed to click on words to navigate). Put another way, the edgeconomy - the millions of markets, networks, and communities that are the edgeconomy - offer marketers the game-changing opportunity to bring brands to life, to build social and cultural institutions around them, to embed value creation into the very fabric of consumer behaviour itself. Of course, to embrace this worldview, you've first gotta drop yesterday's assumptions - like, for example, the one that a firm can ever really "own" a word and what it signifies. In fact, with a little deeper insight, M&C might see that they're using a bucket to fight the tide - attempting to "own" words, as the cost of attention skyrockets, is going to yield seriously diminishing (and then negative) returns. More simply: as consumer hyperfragment, and market power continues to shift to them, guess who already "owns" words - which are really just shared representations of value? You guessed it - markets, networks, and communities, and the prosumers that make them." The sentiment of trying to simplify makes sense - it is the idea that a Brand is developed from the inside out (oops) outside in that makes me queesy. "Just let go, let go, it will all be ok"
I see this. Satchi's new campaign entitled: One Word Equity. Are you people nuts?!! THIS is what you come up with? Have you learned nothing over the past few years about how HUMANS function in the REAL world? And the impact of technology in enabling this behavior? Is this your response to the growing wrenching bile & acid in your stomach that gets worse with the daily realization that you are becoming IRRELEVANT?!! Are you SO arrogant that you think you can OWN a word - OWN anything you have not PAID for? Do you think it is OK to OWN a word? And then make a stupid Flash movie about it. I am still fuming and must tear myself away from keyboard to do some work. Read Brian and Umair's detailed observations & rational thoughts till I return. I pity anyone on the highway driving slow in front of me in the fast lane today.